The IM Buzz Creators, Calvin Woon and Jonathan Teng, have launched a new Private Label Rights (PLR) membership website that they aptly call IM Buzz PLR. For those unfamiliar with PLR, these are products (such as eBooks or articles) that you purchase which give you the right to modify the content, put your name on it and claim ownership. Check out this document for 101 Uses For PLR Articles. Many Internet Marketers use PLR content as a basis to create their own products and sell for major profits. This looks like an amazing turnkey package. 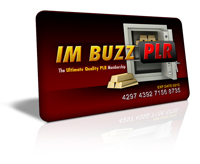 The cost for a monthly membership to IM Buzz PLR is $17/month.